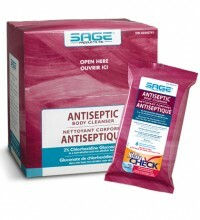 Sage Antiseptic Body Cleanser delivers a unique, clinically effective, 2% CHG solution with the gentle scrubbing action of a non-abrasive, textured washcloth. By rapidly reducing bacteria that can cause skin infection—and providing persistent antimicrobial effect against a wide variety of microorganisms—Sage Antiseptic Body Cleanser makes it easier for facilities to address skin decolonization. Proven to rapidly reduce bacteria that can cause infection, including S. aureus, VRE, MRSA, etc.1 Provides a cumulative effect with multiple applications. 2% CHG solution requires no rinsing and stays on the skin for maximum antimicrobial persistence. Enhances skin decolonization efforts for a wide range of immunocompromised patients. Helps reduce risk of transimtting pathogens from colonized patients to staff, other patients, visitors and surrounding environment. Alcohol-free, latex-free and skin friendly. Won’t dry out skin like alcohol-based antiseptics. Soothes and moisturizes skin with aloe. Premoistened and ready to use right from the package. No additional supplies needed. Large, thick cloths ensure consistent CHG coverage. Makes it easier to cleanse hard-to-reach areas like skin folds. This non-sterile glove is a standard nitrile formulation. A more robust thickness provides a more substantial fit and feel. An inner polymer coating makes donning easy and the absence of powder considerably reduces the risk of skin abrasions. Micro-Touch® DermaClean® are high grip examination gloves. Providing a secure grip in wet and dry conditions, Micro-Touch DermaClean are ideal for instrumentation, handling test tubes or infusion equipment. Ansell’s latex technology ensures a comfortable, well fitting and flexible glove. With an increase of latex allergies, there is more and more demand for synthetic gloves. 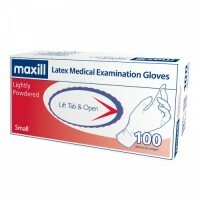 Nitrile, neoprene and vinyl are the different types of synthetic medical examination gloves available today. Latex provides the user with an unparalleled fit and feel. 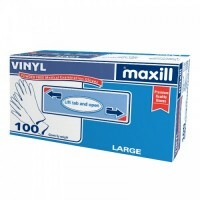 These natural rubber gloves offer excellent tactile sensation, barrier protection and chemical resistance. Latex has traditionally been used throughout the medical world for years and has stood the test of time. 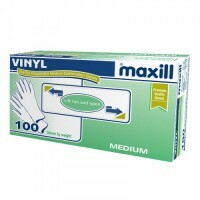 When latex allergies do not apply, this glove is a great choice at an even better price. The Curity Abdominal Pads consists of three layers: soft outer nonwoven layer, fluff filler for absorbency, and a wet proof barrier to prevent fluid strike-through. All four edges are sealed to prevent lint residue and leaking. 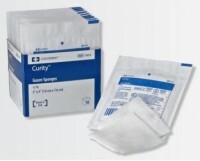 Curity™ Gauze Sponges Sterile. USP type VII Gauze Sponges; Sterile. 12-ply sterile gauze pads. Ideal for applying ointments, prepping wiping needles and more. Highly absorbent, cost-effective and virtually lint free. Available in a variety of sizes. Sterile & Latex Free. 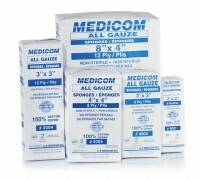 All-gauze sponges with high absorbency allow for the use of fewer sponges resulting in savings of time and money. Elastic netting for holding dressings. 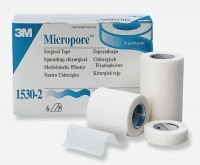 • Can be used for fast and easy retention of all types of wound dressings. 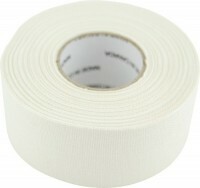 • Especially useful for holding dressings in difficult to dress and small areas. • An excellent bandage alternative in cases where a flat adhesive bandage may cause discomfort or may not stay in place due to patient mobility. 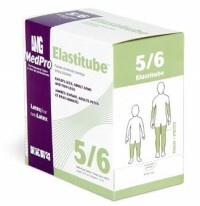 • MedPro Elastinet is composed of a durable combination of Polyester and Spandex that offers added comfort and flexibility. • Highly performing, Elastinet firmly holds dressings securely in place. 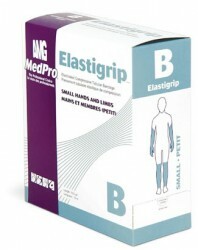 • Elastinet offers a comfortable, yet firm hold by stretching to properly fit the body part being covered. • With 11 sizes available, Elastinet can be applied to an area as narrow as your fingertips or to a surface as large as an extra wide chest. 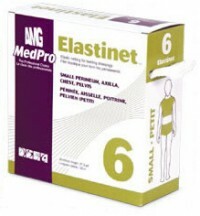 • Elastinet dressing threads are double insulated to help prevent skin irritation. • The Latex free material reduces the dermatitis potential associated with other fabric formulations. Compressive elasticated bandages ideal for a wide range of applications. • Use for support and aid in rehabilitation after removal of plaster casts and for joints in functional casts. • Helps to keep limbs warm after therapeutic massages. • Provides greater comfort for rheumatic conditions. • Ideal to support amputation stumps. • Recommended for treating work and sports injuries, sprains, bruises and dislocations. • Helps to relieve swelling and assists venous circulation for treatment of varicose veins. • Use for prevention and treatment of hypertrophic scarring, edemas and hematomas. • Helps to maintain medication and dressings in place following a mastectomy or reconstructive plastic surgery. • Latex-free to help prevent skin irritation. • Remains secure on wounds and sensitive areas to help protect skin. • Woven, continuous tubular fabric made of water-repellent, top quality cotton yarn. • Preferred wound care alternative to using flat gauze bandages, since no winding is required to be secured in place and to permit freedom of movement. • Acts as skin shield by protecting skin beneath plaster casts. • Used in general and plastic surgery as well as dermatology. 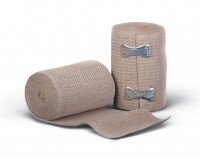 • Suitable as a traction bandage to cover splints and cotton wool padding. Easy, straight, bi-directional tear allows clinician to tailor the tape. Good adhesive to skin and tubing for secure placement. A self-adherent elastic wrap that functions like a tape, but sticks only to itself. Available in a variety of widths. An elastic bandage is a “stretchable bandage used to create localized pressure”. Elastic bandages are commonly used to treat muscle sprains and strains by reducing the flow of blood to a particular area by the application of even stable pressure which can restrict swelling at the place of injury. Elastic bandages usually come in 2-6 inch widths. The wider the bandage, the more compression you get without blocking actual blood flow. Typically, for an adult arm or leg, you want to use a 3- or 4-inch bandage. Adult fingers and kids’ arms and legs can get away with the narrower 2-inch width bandage. 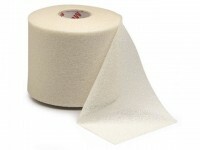 Pro Wrap is a pre-taping foam under wrap that helps protect skin from tape chafing. It can be used to hold pads and socks in place, and is versatile enough to hold up sleeves and create knee straps. Holds hair back and is latex free. Polyurethane pretaping foam underwrap used to protect skin from tape. Area can be sprayed with adherent to keep underwrap from slipping. Can be used to hold pads socks and cold packs in place. Versatile enough to hold up sleeves create a knee strap or protect feet under boots and athletic footwear. Perfect for keeping hair out of your eyes so you can focus on the game. 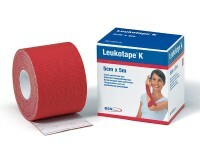 Leukotape K is constructed from a highly elastic cotton substrate coated with a wavelike pattern of adhesive which works with the skin’s natural elasticity. 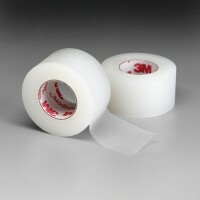 The tape is applied using specific techniques, whereby tape is applied over and around muscles to give support, without affecting circulation or range of motion. 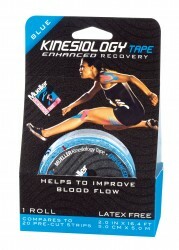 In this way Leukotape K promotes the body’s own healing process whilst allowing complete freedom of movement. Leukotape P is a high strength, rigid tape with a very strong zinc oxide adhesive making it ideal for patellofemoral taping and taping where strong adhesion is required.